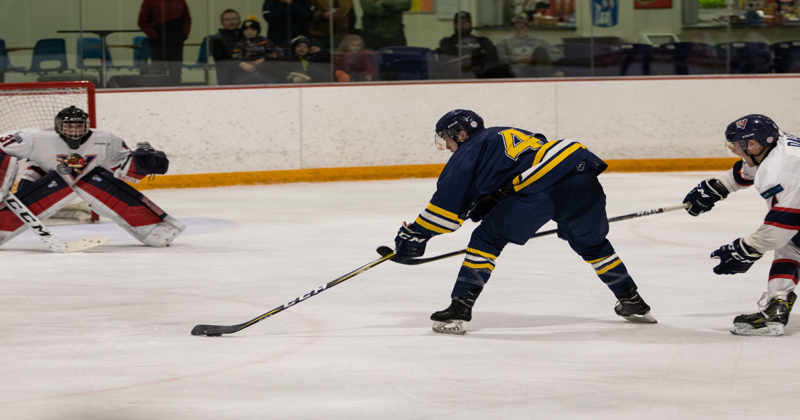 The Briercrest Clipper face off against the Portage College Voyageurs for the second game on Saturday afternoon. Portage with a 4-1 victory over Briercrest Friday evening. The 1stperiod started with both teams reset and ready to play. Portage started with the first penalty of the game at 1:11, #4 Holden Daley for hooking. Briercrest next to the box, #13 Ben Feere— 2 minutes for slashing at 6:49; Portage making use of a power play opportunity scoring at 8:52 #25 Ian Jarvis, unassisted. Making the score 1-0 for Portage, but not for long; #21 Cale Kindrachukscoring his first ACAC career goal at 10:01, assisted by #5 Halen Cordon; tied at 1-1 halfway through the 1st. Briercrest next to score and take the lead at 11:19 #14 Austin Kozluk, assisted by #4 Ryley Cribbin and #28 Blayd Anholt. Briercrest maintains the lead and a cross checking penalty is called on Portage at 12:13, #16 Layne Anderson. Briercrest setting up in the offensive zone, trying to make use of a power play opportunity and at 13:11 #17 Joe Roach scores, assisted by #14 Austin Kozluk and #23 Jackson Siemens; making the score 3-1 in favour of Briercrest. Three more penalties handed out in the 1stperiod; Briercrest's #2 Ryan Laird 2 minutes for head contact at 16:13, Portage #24 Colby Livingstone hooking and Briercrest #20 Russell Olsen for hooking both at 18:33. Period ends with Briercrest up 3-1, shots on goal Briercrest 6 to Portage 9. The 2ndperiod starts out, both teams flying out of the gates. Portage making a goalie change at the beginning of the period, #35 Jordan Brant. Portage first to receive a penalty in the second; interference on #27 Ryan Symington 1:31, and then with a short-handed goal, Portage tightensup the gap at 2:33 #8 Brayden Dale, assisted by #4 Holden Daley. Briercrest scores another goal with beautiful the ice by #4 Ryley Cribbin, scored by #20 Russell Olsen, his first of the season at 12:28. The 2ndperiod ends with Briercrest leading 4-2 shots on goal 18 Portage and 17 for Briercrest. The final period starts with Portage getting a tripping call on #4 Holden Daley at 1:40. Briercrest extends the gap in the score at 5:00, making it 5-2 for Briercrest, #16 Aiden Nicholas taking the puck up the ice, then to #29 Andrew Sorensen and scored by #20 Russell Olsen. Briercrest able to maintain their pace, scoring another goal at 10:34, #21 Cale Kindrachuk's second of the game, assist to #4 Ryley Cribbin. Portage receives another penalty, #10 Eli Jarvis, for tripping at 11:23; and Briercrest penalty at 13:32, #14 Austin Kozluk 2 minutes for tripping. The game concludes in favour of Briercrest 6-2, shots on goal 28 for Portage and 28 for Briercrest. Briercrest head coach, Jamie Ramer, saying, "[Briercrest] played better overall, getting some breaks [they] didn't get yesterday. A more consistent effort, and got rewarded today where [they] didn't get rewarded last night." Players of the game goes to Briercrest College Clippers #20 Russell Olsen, with 2 goals and 1 penalty, and Portage College Voyageurs #25 Ian Jarvis with 1 goal.